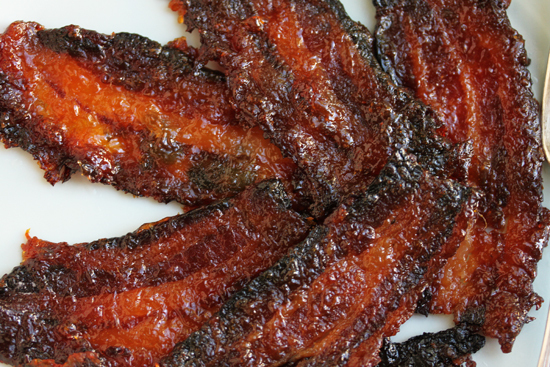 Ok, all you bacon addicts, this one is for you. I know you’re out there, because my BBQ Bacon-Wrapped Shrimp recipe has had the most pageviews of all the posts on my blog. If you do a Google search for Bacon Addicts there are 1,530,000 results. In fact there is a website called Baconaddicts.com that has 39,000 followers on facebook. I eat bacon about 3 to 4 times a year, usually on a Tomato and Bacon Sandwich on Honey Wheatberry bread. 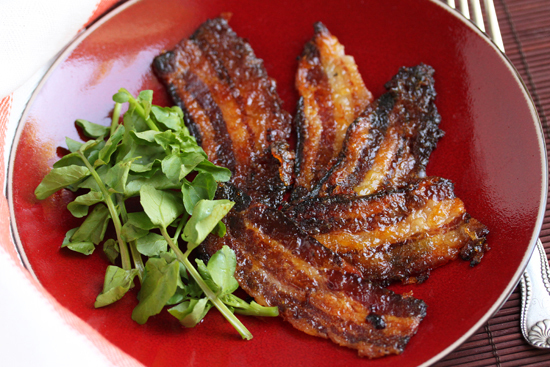 But this Mango-Glazed Bacon is a serious second place. So in order to use all of the mangos sent to me by the National Mango Board, I present my Mango Madness #2, Mango-Glazed Bacon, a porky, smokey, caramelized mango-sugar decadent offering. I am imagining this mango glaze drizzled over vanilla ice cream topped with little batons of Mango-Glazed Bacon. How weird is that? Or not. See the layer of mango glaze on each piece? Are you swooning yet? 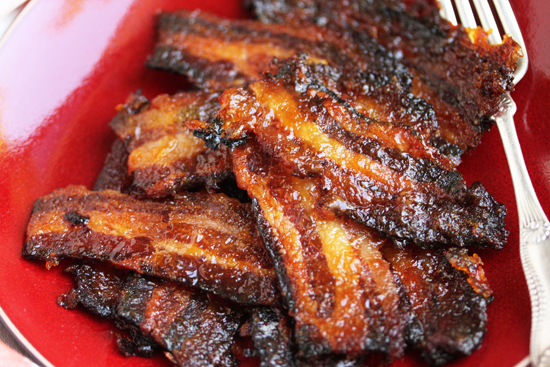 Oh, by the way, did I mention the way Mango-Glazed Bacon smells? It makes your olfactory nerves want to flutter to heaven. Really. 1. Preheat oven to 375 degrees F. Cover a baking sheet with aluminum foil. Line foil with parchment paper to fit bottom. 2. 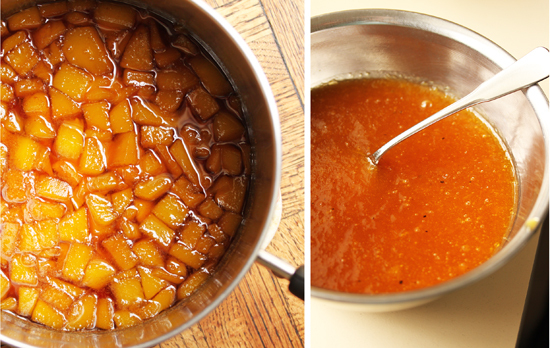 Place sugar and vinegar in a large saucepan and cook until the sugar is melted and it begins to boil. Add mango and cook until reduced by half and mango is soft, 10 minutes or more. Cool slightly. 3. Puree mango mixture in food processor until smooth. Pour into a bowl and stir in the honey. Season with a dusting of salt and pepper. Store in the refrigerator, covered, for up to 3 days. Bring to room temperature before using. 4. 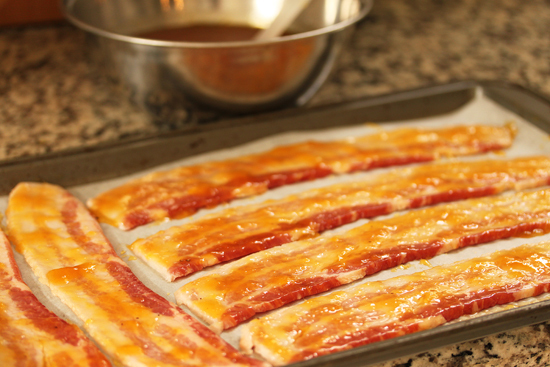 Place 6 to 8 slices of bacon on the prepared baking sheet and brush some glaze on both sides of each slice. 5. 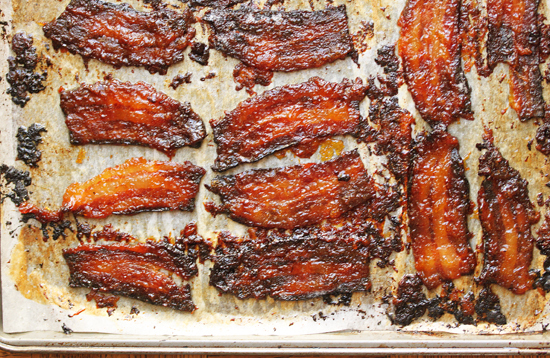 Bake the bacon slices for about 12 minutes. Remove from oven, brush slices with more glaze and turn them over, brushing with more glaze. Repeat 3 more times, for 10 minutes, 6 minutes and 6 minutes. Watch during the last minutes that slices do not become overly caramelized. 6. Remove slices immediately from sheet onto a new piece of parchment paper to cool. 7. Repeat with remainder of bacon. 8. 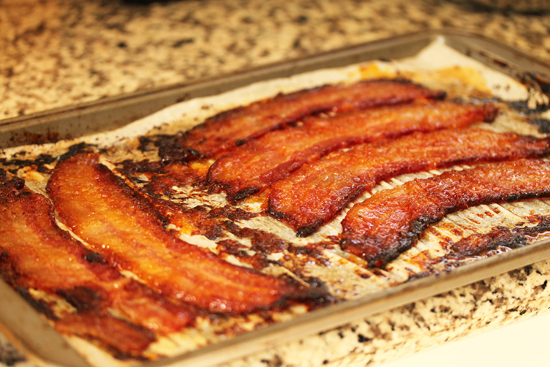 Store cooked bacon in refrigerator in container singly in between sheets of parchment paper. Do not stack, as they will stick together. They are very sticky. 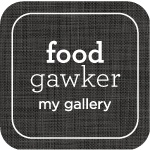 Note: Leftover glaze can be used for ice cream topping, in salad dressings, as a glaze for any meat or fish, in a dipping sauce. Be creative. Or freeze up to 6 months and use to glaze another pound of bacon. 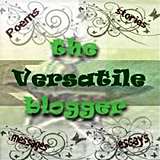 Thanks for linking up. your bacon looks spectacular. Have a great week. Oh, I don’t know how I missed this one. YUM! Mango + bacon = ultra deliciousness! And how beautifully caramelized it is — I just love the look of it!